The Ohuhu Greenhouse is designed to create the best environment for your plants to grow healthily, provide protection against rough weather conditions like rain, wind, and snow, and lets you exercise your green fingers in any place and any season. It is structured with durable rust-resistant steel tubes that will make portable last through the seasons. Measuring 27” (L) x 18“(W) x 62“(H), this greenhouse with 4 shelves allows you to display your adorable small plants, gardening tools and pots in all its green glory, with ample room to store all of your gardening supplies or plants. It is also designed with zippered roll-up door for easy access and screened ventilation for optimum air circulation. Ideal for starting seedlings, protecting young plants and for extending the plant growing season. 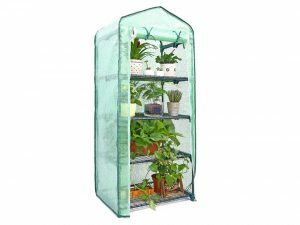 - Create the right space for your plants: This portable greenhouse creates the perfect conditions for growing starting seedlings, young plants and flowers, and helps to extend plant growing seasons. - Large Space: Constructed with 4 steel wire shelves measuring 27” (L) x 18“(W) x 62“(H), which makes space for all your blooming flowers, sprouting plants and fresh vegetables. - Rock-solid Stability: Structured with heavy-duty steel tubes for extended durability, supported with a 23.4lb weight capacity, so it is strong enough to hold seed trays, pots and plants growth light. - Beautify your garden: Designed with zippered roll-up door for easy access and screened ventilation for optimum air circulation. Giving your patios, balconies, decks and gardens a touch of green, without any fuss. - Easy Movement and Assembly: All parts are detachable, so you can set it up wherever you want to, and move it when the seasons shift. No tools required.